Moving engagement with no visible reinforcers. Handler maintains the dog’s focus while actively moving around for 15 seconds. Purpose: Maintaining engagement and focus while moving between exercises is critical to a relaxed and enjoyable partnership with the dog. Exercise set-up: The handler turns to the dog and invites the dog to interact while moving around the area. Speed of movement (fast or slow) is not judged. The dog must stay engaged with the handler while moving informally for the full 15 seconds. Briefly looking away, spins, running in small circles, play bows, etc. are all allowed as long as the dog maintains a connection with the handler. Handlers may walk backwards or forwards, encourage their dogs to jump up on them or around them, or otherwise maintain their connection and engagement with the dog while moving in the area. 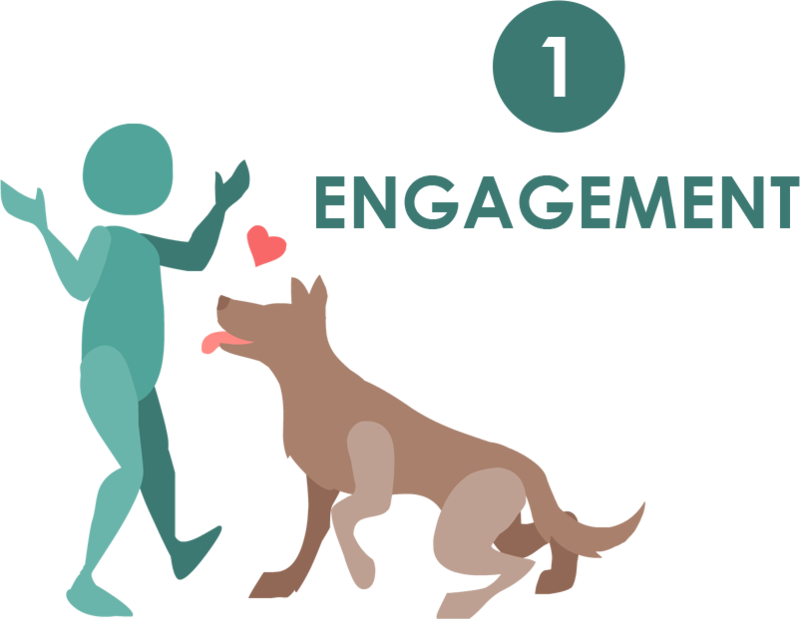 The exercise begins when the handler calls the dog informally to begin interaction and ends after 15 seconds of sustained interaction. Non-qualifiers: Handler cannot keep the dog’s attention without commanding or insisting the dog stay engaged. Dog will not stay with the handler. Handler does not move from a single spot. Handler appears to be following the dog rather than the dog following the handler. Video does not permit the exercise to be adequately judged. Tips: The defining criteria of this exercise is movement, so keep moving! Your dog should willingly stay with you with movement and without a formal cue. Feel free to count out loud to your dog to keep track of your time! This last video shows perfectly acceptable stage 2 engagement – low key!